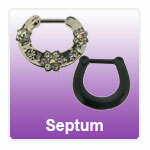 Septum Clickers - our range of easy to fit hinged septum clickers for your septum piercing. Septum rings and bars from JoBananas Body Jewellery - Take a looks at our extensive range of septum jewellery in plain steel, black or gold plated finish in jewelled and plain designs. We also have a range of non piercing septum hangers that really look like a real septum piercing but do no require a pierced septum to wear. Other types of jewellery suitable for Septums can be seen by clicking on the pics below. These are Ball Closure Rings (BCR's), Circular Barbells (Horseshoes) and Bar Closure Rings. "Great product, well packaged, great service and prompt worldwide postage." "Dear Jo B. ! I was so impressed with the last Bio flex nose stud you sent me l'm ordering another ! The last stud l ordered was fantastic. It was..."
"Received my order today, thank you so much for the quick delivery! Will definitely use your services again :)"
"Fantastic service even during the festive holidays, after I realised I had messed up the original pre Christmas order. Thank You so much for your..."